According to the official description, “made of durable nylon.” The gray stripes look to be made of some reflective material, but I’m not sure. On one side of the bag, a mesh side pocket for water bottle or commuter mug. Can be used as storage and zipped completely closed. On the other side of the bag, a zippered MP3 player pocket with headphone port. The top of the flap has a generous 11-inch zippered pocket. You can access the two side pockets and flap’s zippered pocket with the flap snapped shut. Open the flap to access three pen/pencil holders, an open mesh pocket (4-3/4 inches wide by 4 inches tall), and a covered zippered pocket (7-1/2-inches wide by 5-1/2 inches tall). Has both a briefcase handle and adjustable shoulder strap. I got this messenger bag for christmas, and it rocks! It’s the perfect size for all my books and sometimes even books + laptop. I give it a 4 out 4, A+, gold star! I have this bag and absolutely LOVE it! I bought it at the NBC Store in New York and it has not left my side since. I recommend it to anyone. Thanks! I like this bag. Not the most sturdy for laptops and other such sensitive equipment, but excellent for paper goods, documents. I actually slipped a padded packaging envelope to pad my back from my binders. Once, while on the commuter train, a man asked me if I worked in the paper industry and went on about the heinous crime of deforestation and logging for a good 10 minutes. One point worth mentioning: inside pockets are relatively water tight and can withstand multiple loads of Jello-encased office supplies. This safety feature prevents accidental spillage of said Jello onto warehouse floor, and thus prevents industrial Jello accidents. Do I hear a dial-tone? Because this bag is off the hook! No lie though it is pretty sweet. I’m gonna have to convince my mom to buy me one. I totally need a bag like this. I’ve been looking around and haven’t found one to suit my needs but this may just do it! Apple computers and dunder mifflin! I have this bag and I love it too! The only things I don’t like is that it pills (gets those little balls when it rubs against clothing), and the plastic strap thing is not terribly comfortable if you have a lot of stuff in it, but honestly it’s the best bag I’ve ever had. It has all sorts of little pockets and my fave part is the iPod holder with the hole for your earphones. 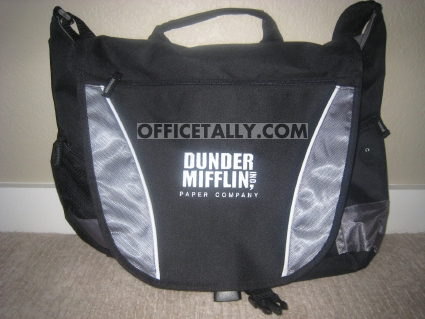 I suspect Jim would have a bag similar to this. Yey Mac! I have an iBook too – sweet! I was debating getting this earlier this year for an upcoming trip and now I think it’s a necessity! (Shoot, especially when you can utilize a discount…that’s a huge help today!) This’ll be the perfect all-around tote for travel books, camera, wallet, etc…can we expect to see more fun Office merchandise reviews in the future? Tanster, I would love to run into you while you’re OfficeTallying with your DM gear. I swear to God, it would be a celebrity sighting. That’s a pretty good deal for such a handy bag! Consider it bought! I have this bag. The only problem I’ve had with it is that the strap was starting to rip because I carried too many books in it (thank you college). So on Monday, I’m starting a professional musical theater workshop in NYC for the Summer, which TOTALLY makes me feel like Pam, by the way, and I’m pretty sure I’ll be buying that bag tomorrow. It seems perfect for sheet music, notebooks, cds, etc. Plus, my IPod & bottled water, obviously, haha. Thanks for the extensive review, Tanster & everyone else’s comments! This bag looks great! I am looking for a new one; I used to carry a vertical case but I got tired of it. I will definitely buy! I ordered this bag and received it today an I love it. I am flying tomorrow to Florida and it is able to fit all the things I need while on my flight. Love it. Go Powerbooks! I have a Macbook and love it! I got this bag some time ago, but stopped using it because it didn’t hold all my junk. Great bag, just not big enough for me. LOL That’s what he said. Previous PostPrevious 24-Hour Contest: Say What?